Was it really "crunchy, smoky, sweet love"? Maybe. 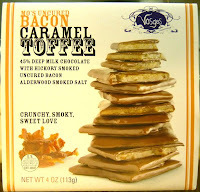 I ate a whole stack of Mo's Uncured Bacon Caramel Toffee, from Vosges (Chicago), for dinner. The little pile of 45% deep milk chocolate squares with hickory smoked uncured bacon and alderwood smoked salt quickly disappeared. These sweet and savory crunchy squares could be eaten for breakfast or lunch as well -- although I recommend adding some vegetables and fruit to this chocolate bacon entree/dessert. 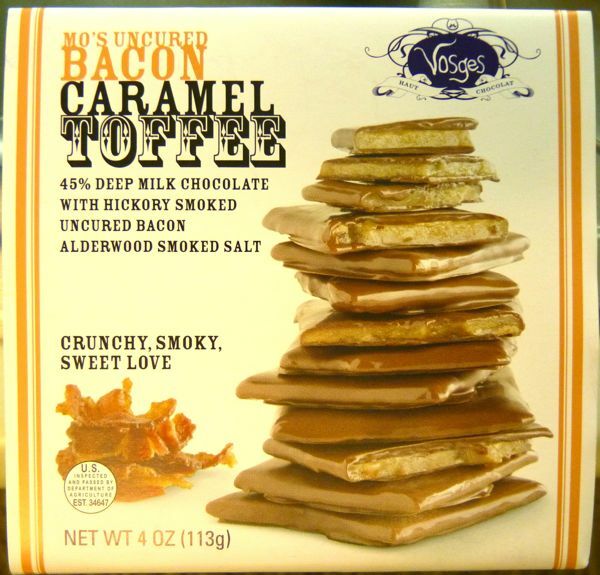 Today was Day #3 of Chocolate and Bacon Theme Week.